Yes, that’s another avenue I can go down. One way or another, I consider it a “Tablo problem” because my TV with the other split from the antenna works great, and my Plex media and Sling stream virtually perfectly over my WiFI. So whether it’s Tablo’s ability to receive the OTA signal, or it’s ability to deliver it over my network (WiFi OR Ethernet – both tested), I don’t know. But my antenna-connected TV and other HD media are living well on the same infrastructure that the Tablo is tripping on. EDIT: I just worry about how many items I’m buying from Amazon for testing purposes and then returning as “did not work for me”. I can’t afford to keep a bunch of merchandise I don’t need, and I don’t want my account flagged. I know how you feel about it being a Tablo problem. I’ve had two problems that were Tablo problems but not with any other devices (another DVR and a USB tuner). A PID on a channel no other devices had problems with but the Tablo had. And a station that would cause the Tablo to go belly up but not the other devices. I agree that at those distances you “shouldn’t” need a preamp. However it’s tough to judge from photos how “line of sight” your line of sight actually is. The beam width on your directional antenna won’t cover the spread you have. The fact that you’re picking up Akron at all is probably more due to transmitter strength and close proximity. If the Akron channels are mainly repeaters, I think I’d aim more directly at the Cleveland towers as aiming off to the right as you are is probably not optimal for those towers. You need to find information on that antenna. What’s the beam width? And in that style directional antenna I’d be surprised if it was constant. I had a Yagi 91XG with a beam width of 42 degrees at 470MHz and only 24 degrees at 698 MHz. So beam width and transmitter frequency. Right now. At this point. I’d aim that antenna at the Cleveland towers and either drop the Akron ones or accept what you get from them while aimed at Cleveland. Is there any Akron station you can’t live without? I agree that at those distances you “shouldn’t” need a preamp. However it’s tough to judge from photos how “line of sight” your line of sight actually is. 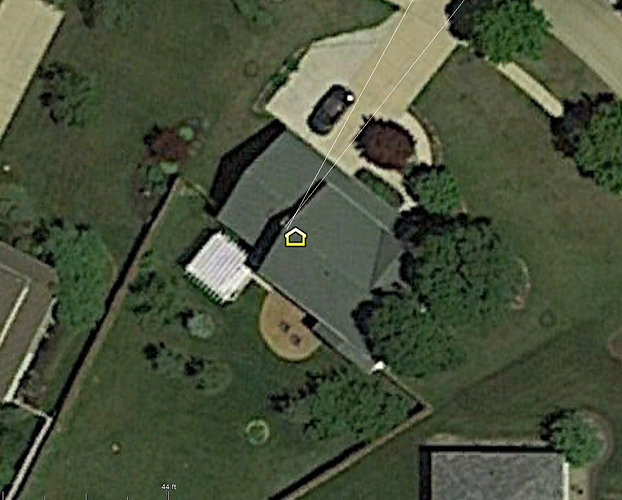 My house is on the left at 1,125 feet above sea level, and the antenna is roughly 25 feet above ground level, putting it at 1,150 feet. The WKYC transmitter is at 1,039 feet above sea level, but the tower is 861 feet tall. RabbitEars computes the antenna height above sea level as 1,900 feet, which happens to be 861 + 1,039. 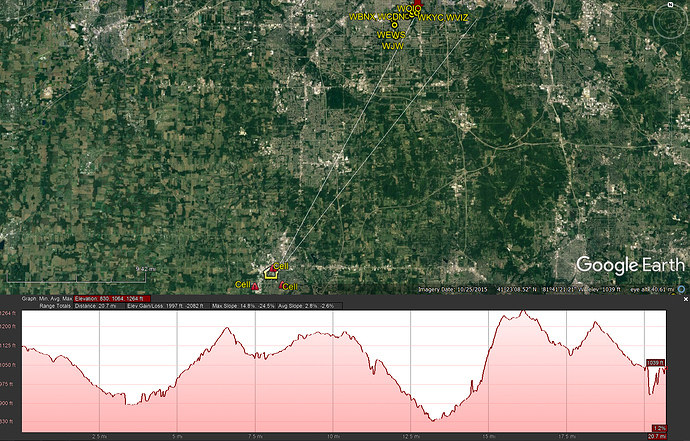 So RabbitEars and Google Earth are in agreement on the ground elevation. That puts the transmitter way off the scale of that profile, and seemingly true line-of-sight for me. If the Akron channels are mainly repeaters, I think I’d aim more directly at the Cleveland towers as aiming off to the right as you are is probably not optimal for those towers…Is there any Akron station you can’t live without? 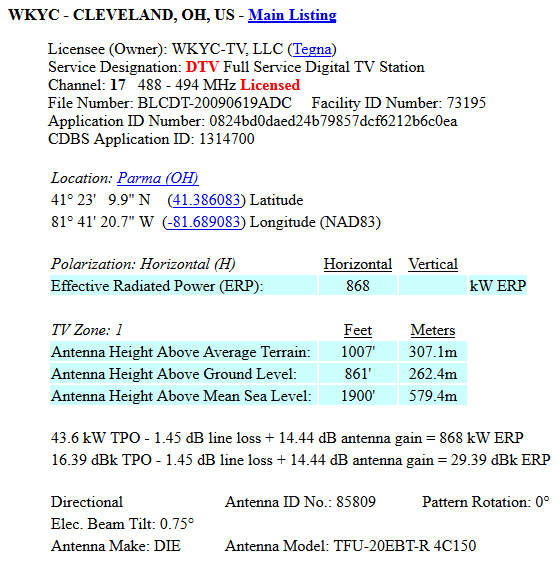 Just the one Akron transmitter is a repeater, because the Cleveland CBS station (WOIO) is on RF10, which is interfered with by a Canadian station (and will remain so after the repack…). So they have the repeater in Akron to help more people pick it up. The one Akron station I couldn’t live without is the PBS station. I’d get a second antenna just for that station if I had to, but I’m hoping that’s not necessary (more for aesthetics than cost). If you needed a second antenna, I’d recommend the one @ben1 has. The Antop is aesthetically pleasing (white panel against a white wall). I wouldn’t mount it high up (it’s pretty powerful) - place it against a wall. Two of my friends have bought it and they are very pleased. If mine ever fail this is the one I would get. One Antop model comes with a preamp (which I have) and it is pretty good. In fact at your signal levels an attic antenna would do. Wow! This seems to be the zombie apocalypse thread. It’s like trying to pass an elephant through the eye of a needle. If the user is willing to watch television over the ethernet all this coax wiring seems needless. You would think you could run a short RG6 coax into the office and connect it to a quality powered amplified/splitter. You connect the output to a TV and you either have all the signals with a strong signal and good sound to noise ratio or you don’t. If you don’t and either adjusting the signal or getting a good antenna doesn’t resolve the problem you are SOL. Once you have a good signal you just connect it to a tablo and/or hdhomerun. Wire those to a 4-port gigabit switch and wire the switch into a gigabit AV2 powerline adapter. And unless there is something funky with the house’s electrical wiring you should be done. Everything else is a problem with getting a signal to your various playback devices. This is, basically, your antenna. It looks like your RCA antenna was actually made by Winegard. You can see what I mean about how the beam width changes at frequencies. For that channel 17 you referenced above you would be in the wider beam width of the antenna with less gain. So, collectively, it’s been established that either my signals are really really strong and shouldn’t need any amplification, or my signals are too weak due to my directional antenna diverging from the direction of the transmitters. Tablo Support is in one camp, but all logic says that it shouldn’t have worked perfectly during spring, summer, and much of fall last year and then experienced LOSS of signal once the leaves started falling. Current path is in blue. It enters the basement just off the photo to the left, then makes its way through the amp, all the way across the photo to the splitter on the right side of the basement, then up the end of the house (not pictured) to the second floor office. Proposed path in red. Tucked under the eave on the back of the house all the way to the office, just around the corner from where the red line disappears. This would probably come close to cutting the cable run in half. I assume the antenna could still be wired/bonded to the grounding rod near where it currently enters the basement? And the power inserter can go all the way at the end of the run, inside the office? Even if the problem would turn out to be something else completely, is this the route that would be the absolute best case scenario from an elimination/minimization-of-all-sources-of-interference-and-excess-cable-run perspective? EDIT: And just thinking about future-proofing. If the Tablo is working well, I don’t care about hardwiring the TVs to the antenna. But as a backup, can a distribution amp be placed at the antenna, with the proposed red split going direct to the Tablo in the office, and the other split going to the basement as it currently does. Then inside the basement, add another 4-way splitter to make use of the RG6 runs already going to various rooms of the house. With the better tuners in TVs, would that give me a fighting chance of getting a lot of channels on the TVs even with the extra 4-way split, in the event that the Tablo acted up in the future, or if we simply wanted to watch live TV with a faster-responding tuner? Given that description, if you call the antenna guy out, I’d have him move the antenna to the end of the house where all the action is taking place. Antenna cable enters the house in that upstairs office. Tablo resides there as does the power inserter for the amp. Seems to me this would give your Tablo the best signal with the least amount of cable between it and the antenna. You already have a cable run from the office to the basement so one splice in the basement (where the splitter is now) connects that cable to the cable running to the TV. Eliminates a TON of extra cabling. A simple ground wire could be run under the eaves as depicted by your red line and down to the current grounding location. Just a note here… don’t be tempted to let them just drop a ground wire to a separate grounding rod below the antenna. A second ground rod must be bonded to the main house ground rod. I had to do this (opposite ends of the house) and had to run a heavy wire under the turf all the way around the house to the main house ground. Given that description, if you call the antenna guy out, I’d have him move the antenna to the end of the house where all the action is taking place. He avoided that side of the house for a reason, better seen from the air. If you move the antenna as I mention, and everything resides in the office (right below the antenna) you could use that existing coax from the office to the basement as your “TV Feed”, put a distribution amp in the basement (which you MAY not need) and feed all of your TV from one location in the basement. I’m pulling signal from about 35 to 38 miles… through trees… I do have a preamp installed at the antenna. I enter the house, run 40 feet of cable to a wiring closet, and then split the signal 4 ways… without a distribution amp. 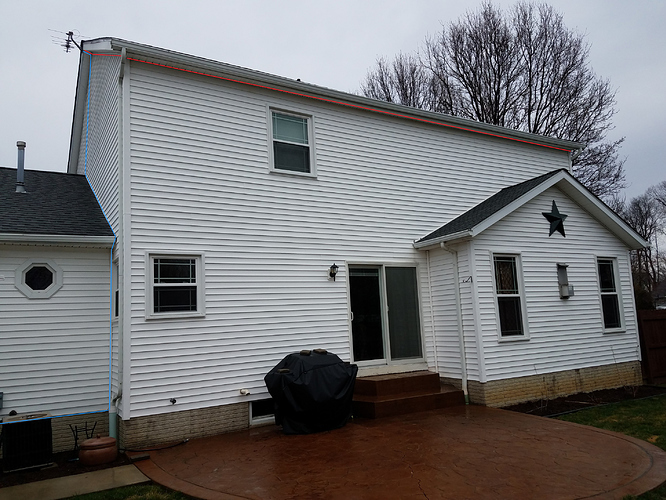 My personal opinion is that if you have to get an antenna guy out there anyways, move the antenna and get rid of a boatload of excess cabling. just saw the photo. OK, that end is out :D.
But if you can eliminate half the cable between the antenna and the Tablo, I would do that. Just texted the installer to get his input on an estimated cost to reroute the coax. He said he just left a customer’s house with a Tablo and Roku and was getting unusual breakup on the Tablo, but perfect picture on all the TVs. He said he’s happy to make the changes, but he has a low opinion of the Tablo tuners/circuitry and is 99% sure it won’t make a difference. He’s supposed to call me to talk later, but, clearly, even if the Tablo needs to be babied and the signal spoon-fed to it, too many people are having great experiences with it to call it a lost cause. I like your optimism but there’s clearly something afoot here, some will say we’re all fanbois but many have had no issues with the Tablo tuners. It doesn’t require perfect signal to work well, but hopefully you figure it out. There’s been so many options discussed in thread. Did you ask him why he used a CATV amplifier? That I find suspect at best. No, I didn’t want to challenge him on anything he did. He was too busy on a job to get into things too much. He did mention that he uses Plex with a TV tuner card in his PC. I immediately thought, “Yeah, but I need this to be usable for my wife with the TV remote, not requiring me to sit down at the computer to schedule recordings.” I then YouTubed some tutorials on the Plex Live TV and DVR functionality, and it seems it’s pretty slick and is controllable from the Plex clients just like we’re used to watching our archived audio/video files. I’m really tempted to try this, but it feels so wasteful to lose everything I’ve invested in Tablo (lifetime guide, etc.). I know – prime example of the sunk cost fallacy. I think my biggest concern about the Plex route is that I’m not sure if my PC can handle it. I was surprised that it handles the server duties for the HD content sitting on its hard drives. But how much extra processing power is required to manage a 4-tuner card and all the simultaneous recording/streaming that would be inevitable during our peak usage? So if I were to seriously consider the Plex route, it’s a matter of comparing the time/money spent trying to get the Tablo functional vs. the $100 tuner card plus potentially whatever it would cost for a more capable server. I already have the lifetime Plex Pass, so it looks like the guide data is already paid for with that. Have you tried all the suggestions in this thread - some that don’t require spending money? Use my multimeter to map the 5 unused cable runs in the basement, find the one that goes to a wall jack in the room closest to the router, and move the Tablo there and connect to the router via WiFi. Disconnect the modem and see if my recorded programming plays flawlessly or still buffers at times. If it plays flawlessly (except times where there are reproducible permanent glitches in the recordings), then maybe my problems with Live TV and recordings are caused by Tablo interacting with the outside world instead of concentrating on its job. Put the amp in the office immediately before the Tablo.